Zone-Reflex: Is it possible to live without food or water for 70 years? Is it possible to live without food or water for 70 years? This 'nectar' or 'elixir' is maybe something, but unknown so far. Head as manufacturer of nutrition is unheard, but in fact he has been examined under control and tested and is in very good health (better health than someone half his age, they say). From April 22nd until May 6th 2010 (then 83 years old) in the private hospital Sterling Hospital, Prahlad Jani was observed and tested by Sudhir Shah and a team of 35 researchers all from the Indian Defense Institute of Physiology and Allied Sciences (DIPAS) and other organizations. The large team studied Jani daily using clinical examinations, blood tests, and scans. 24 hour CCTV surveillance was used to ensure the maximum observation of Jani’s actions during the testing period. According to researchers, the only time Jani was taken out of his sealed room was for tests and exposure to sun. During these times, continuous video recording was done to ensure authenticity of results. Jani only had contact with any form of liquid when he had an occasional bathing session, which first took place on day 5, and when he would gargle some water. It is important to note that his toilet was sealed to test his claims that he did not urinate or defecate. After the fifteen days of intensive observation during which Jani did not eat, drink or go to the toilet, all medical test results came back as normal and doctors described his health as being better than someone half his age. Interestingly, doctors reported that although the amount of liquid in Jani’s bladder fluctuated and that Jani appeared “able to generate urine in his bladder”, he did not pass any urine. The reported levels of Jani’ leptin and ghrelin, two appetite-related hormones, suggested that Jani may be demonstrating an extreme form of adaptation to starvation and water restriction. Picture from Daily Mail. Blood tests, hormone profiles, MRIs and angiographs (imaging tests of the blood vessels) all pointed to the conclusion that Mr Jani had not needed to eat, drink or use the toilet once. Dr Ilavazhagn said: ‘Clinical, biochemical, radiological and other relevant examinations were done on Prahlad Jani and all reports were within the safe range throughout the study. He is healthy, his mind is sharp. When he reached the age of 11, he underwent a religious experience during which he became a follower of the Hindu goddess Amba. In her honour, he chose to dress as a female devotee, wearing a red sari-like garment, nose-ring, bangles and crimson flowers in his shoulder-length hair. In return, Mr Jani believes that the goddess has sustained him ever since by feeding him with a lifegiving, invisible ‘elixir’, which has supposedly given him the strength to continue without food or water. 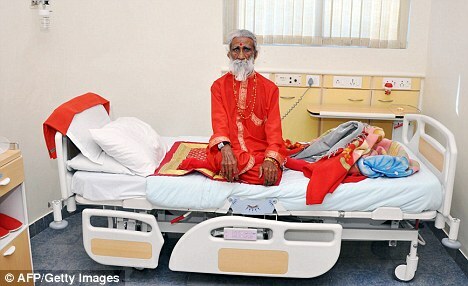 For at least the past 40 years, Mr Jani has been living, hermit-like, in a cave in the jungles close to the Gujarati temple of Ambaji. He rises at 4am, spending most of the day meditating. "Although I walk 100 or 200 kilometres in the jungle, I never sweat and don’t feel tired or sleepy," he says. "I can meditate for three, eight or 12 hours — or even months." In 2003 he underwent his first hospital investigations. Then, as now, he was placed under the care of Dr Sudhir Shah, a consultant neurologist from Ahmedabad who specialises in studying people with seemingly ‘supernatural’ powers. While the results secured him an international following, they failed to offer any concrete answers. As a result, Dr Shah and the military team decided to repeat the experiment this year. Dr Shah has been in charge of three similar investigations over the past ten years, and he has never allowed independent verification. In 2000, he was asking for funds to investigate a man. Manek, he claimed got his energy from the sun, just like plants do. In 2003, he even approached NASA for funds to investigate Mr Jani, claiming astronauts might benefit from the research. This particular hospital, led by this particular doctor, keeps on making these claims without ever producing evidence or publishing research. The 2000 year study of Manek's fasting continuous for 411 days, as per jain tradition.(i.e. taking only boiled water during day time and just no other food or liquids) is published here. A hypothesis. You will agree that such a prolonged continuous Jain fasting for religious (Spread of Ahimsa and other high mottos); scientific purposes (to create awarness about Sun-energy); also aimed at solution of four way human crisis (Physical, Mental, food; neurological) under scrupulous daily medical supervision is unheard of. (1) Reducing calorie requirement by chronic adaptation (hibernation). (2) Deriving basic energy from cosmic sources-chiefly, `sun energy'-solar energy (from environment, other humans). (4) Genetically or phenotypically a different body disposition. The method practiced by Manek : To look at the rising sun daily, with naked eye and without blinking the eyes, as far as possible. To look for a few seconds initially and then every week to increase by few few seconds to ultimately reach up to several minutes. Eyes and specially retina must be healthy. Through complex ways, distinct pathways this energy must enter the body. Is it a direct entry in to the physical body or it enters through auras (modulator) of human body. There is a pathway from the retina, to the hypthalamus, called the retinohypothalamic tract. 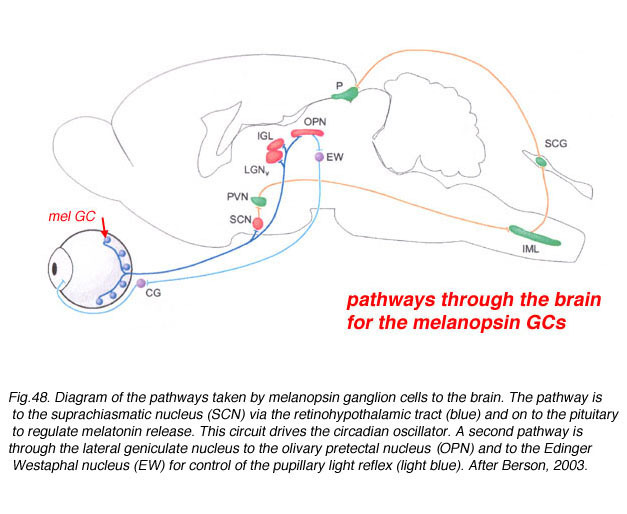 This brings information about the dark light cycles to supra chiasmatic nucleus (SCN) of the hypothalamus. From the SCN, impulses along the nerve travel via the pineal nerve (Sympathetic nervous system) to the pineal gland. These impulses inhibit the production of melatonin. When these impulses stop (at night or in dark, when the light no longer stimulates the hypothalamus) pineal inhibition caeses, melatonin is released. The pineal gland (or the third eye ) is therefore a photosensitive organ an important timekeeper. This solar (light and heat) energy may be transformed into electrical, magnetic or chemical energies in body. The real question is, what sad and sordid circumstances allow this deception to exist. In the text it is clearly said, the religious Jain fasting. There are deaths too. There are cheatings. But what got my attention, is his eyes. Look at them. Not normal.